We test paddled two Hobie Mirage kayaks at Santa Fe Lake near Wichita, Kansas on Memorial Day weekend this year. My son Dylan paddled the inflatable version: the Hobie Mirage i12s and my wife and I both paddled the hardshell version: the Hobie Mirage Outback SUV. Both kayaks were rented from Brooks Canoe and Kayak in Augusta, Kansas. To my knowledge, Brooks is the only kayak outfitter in the region that is offering the Hobie kayaks for rent. The kayaks are quite costly and require some special handling to avoid damaging the cool pedal propulsion system that makes these particular Sit-On-Top kayaks so different from others. That being said, these are lake kayaking boats that just might change your whole attitude about what kayaking can be. We were stoked to find someone to rent them to us! Steering the Hobie Mirage is handled by a small lever near the handrest. A lever one one side operates the rudder and I found it quite intuitive and easier to use than most. The lever on the opposite side is used to stow or deploy the rudder. The rudder combined with the pedaling makes it turn pretty fast for such a wide and stable SOT kayak. Both versions of the kayak performed well, even in lots of boat wake like we were enjoying on Santa Fe Lake. We used narrow docks to launch and land the kayaks, rather than sliding off a muddy riverbank as is my custom. This is a good idea for protecting the pedal drive system. Hobie kayaks offer an innovative pedal-driven kayak propulsion system. It uses flippers under the hull to move your kayak forward much like a penguin swims. It moves the kayak much more quickly and quietly through the water than paddling a normal SOT kayak. This means you can travel much farther across the lake to reach that special fishing spot. It also leaves your hands free for fishing and photography. You still carry a paddle stowed on the side of the kayak, but it usually only comes out for movement through shallow water OR if you want to go in reverse. This is a good thing because I really didn't care for the Hobie paddle...too much flex. Ever want to try kayak sailing or add an electric motor to your kayak? Hobie makes it easy to add those features to their Mirage kayaks. Hobie offers tons of great kayak and fishing accessories. Heck, you can even get a Hobie Bimini Sun Shade and carry your shade anywhere you paddle! If you have the scratch, Hobie makes some amazing lake kayaks. I'm not convinced the system is rugged enough for river use, but it is removable, so you don't have to risk your Mirage-drive bouncing down the Lower Mt. Fork River. What About Kayak Pedaling in Oklahoma? My wife tells me that Dave Lindo at OKC Kayaks has a couple of pedal-powered kayaks made by Native Watercraft. So, there is another handy excuse for heading to Oklahoma City to visit with our state's newest outfitter. 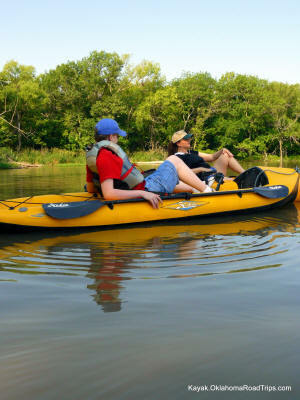 Much like Brooks Canoe & Kayak, OKC Kayak offers a suprisingly vast selection of kayaks to rent. Renting is the best way to find the perfect kayak for your needs and it is a whole lot of fun. Know your needs, know your budget and know how you are going to transport your kayak to the water...before you buy. If you want all of the gory details of our Wichita, Kansas Hobie pedaling trip just visit our new Kansas Kayaking page at OklahomaRoadTrips.com. I love my Hobie Mirage Sport... I can not believe how fast it is. Thanks for sharing your story. I think this is a great boat for lakes, but I don't think it would do as well as a standard kayak in many of the rivers that I like to fish. It has a lot of nice features. Not only fast as Monster Jack pointed out, but you can endure longer sessions so you cover much more area. It looked like a bit of work getting it from the trailer to the water and not having a reverse was mildly frustrating. If I lived on a lake this would be a no-brainer, but for my mobile lifestyle...I just don't think it is the boat for me. Go for the best quality product possible and research before purchasing one. Wasting money is not something anyone likes, better spend sometimes on research and get the right fishing accessories.